Dry, hard, restrictive, challenging and polarising: St Jean d’Angely was this and more for the Grand Prix of France and the ninth MXGP round of the FIM Motocross World Championship where Rockstar Energy Suzuki’s Clement Desalle performed superbly to claim both motos and toast his third overall triumph of the season in front of 32,000 spectators. Back on the calendar after the French fixture had de-camped to Ernee in 2013, St Jean was busy and appreciated by the fans that lapped-up the summer temperatures and generous sunshine close to the west coast. For the riders the tight hillside terrain was either a tricky and demanding prospect or ultimately a frustrating one through the search for lines and overtaking spots. 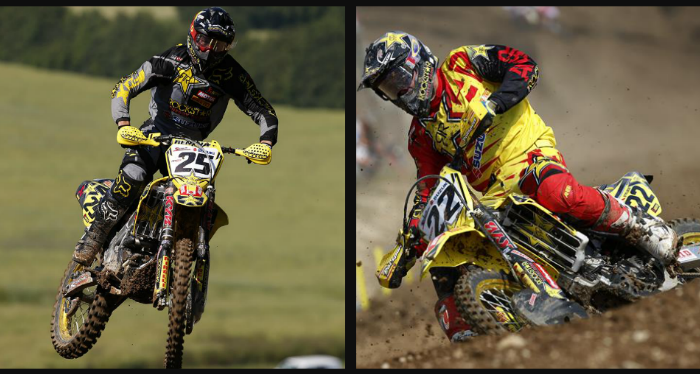 Desalle came to France after winning three of the last four MXGP motos. He marked the fastest lap on this RM-Z450 in Timed Practice and rode to a confident second position in the qualification heat race on Saturday to set him up nicely for Sunday’s 30 minute and two-lap motos. Race day was all about a duel with World Champion Antonio Cairoli as the two principal rivals for the 2014 title dictated the pace. The ‘#25’ shadowed the Italian in both sprints and bided his time, applying pressure for a mistake. Remarkably Cairoli erred in the closing stages of both outings. Desalle pounced on an awkward line by his peer in Moto1 and then fended off Cairoli’s renewed threat before the chequered flag; less than a second divided them at the line. With two laps to go in Moto2 Cairoli was unsighted by a backmarker and crashed, leaving Desalle with a clear track to extend his run to five moto wins from six and two GP triumphs from the last three. Never a fan of St Jean, Kevin Strijbos struggled to gel with the circuit on Saturday. The Belgian experimented and tweaked his race set-up and found some improvements and an effective speed and rhythm on race day. His start was not the best in the first moto but he reacted quickly in the opening phases to reach fourth. His luck deserted him in the second affair when he had nowhere to go to avoid the fallen David Philippaerts on the second lap and hit the ground himself. From last place Strijbos reached 13th for sixth overall. With over half of the season now consigned to stats sheets and results pages Desalle is still second in the MXGP standings with a gap of just 20 points to Cairoli. With 25 points awarded for a moto victory the championship chase is still close. Strijbos remains fourth with a distance of 82 to the top three. Grands Prix in Italy and Germany will form the next successive stint of the MXGP calendar. The journey to Maggiora will begin in over a week with the race taking place on June 14-15 and Teutschenthal occurring seven days later. Desalle won a moto last year at Maggiora and at Teutschenthal he was part of the victorious Belgian Motocross of Nations team in September.